The tool boxes were picked up over the years, when the prices were right. I have one of them 20 years now. Two of them belonged to a friend who sold them to move to Australia. 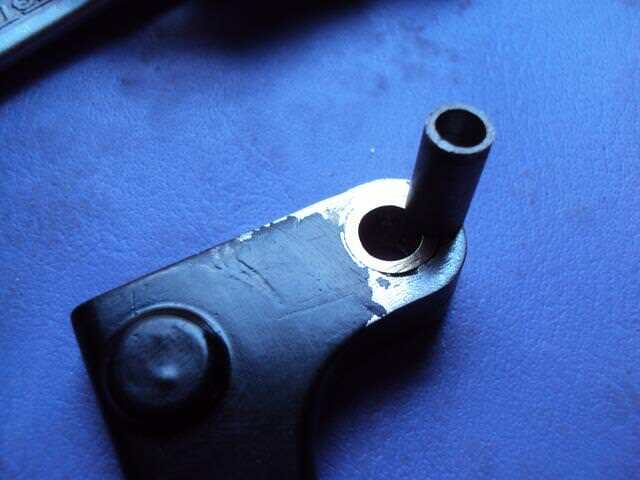 The clutch lever repair, a press fit brass bush to the lever and then a new pivot slieve, which was missing. a new lever is six quid, but I am broke and can fix it - so i did. I disassembled the switch gear, it was pretty nasty, with alot of corrosion. cleaned it up and painted them. I masked off the original decals. They are worn but better than none. I had to scrape some of the paint off the handlebar, as the kill switch earths through the switch body and then the handlebar. Brilliant, properly impressed. This sums up motorcycle ownership in one sentence. Thanks for the kind comments, it keeps the show on the road and hopefully will spur others on to get their bikes up and running. I tried to preempt sods law during the week, by fitting the bodged exhaust I have. The reasoning was the autojumble that was coming up - surely if I fitted it the day before I would find a new one and have to take the old one off again? 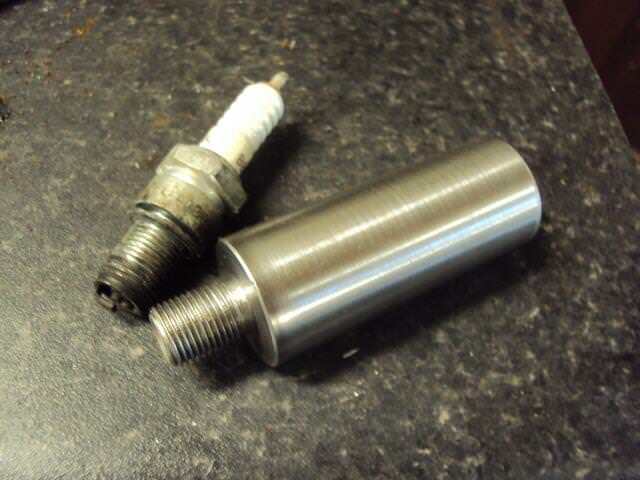 No such luck, but I did find an Indicator stem at the bottom of a big box of broken indicators, only 3 more to go now. I stripped an old loom for the correct colour wires and end connections. This was for the headlight bulb holders which were the wrong fittings and colours. - soldered in and now it all matches up. Had to replace the horn wires too. 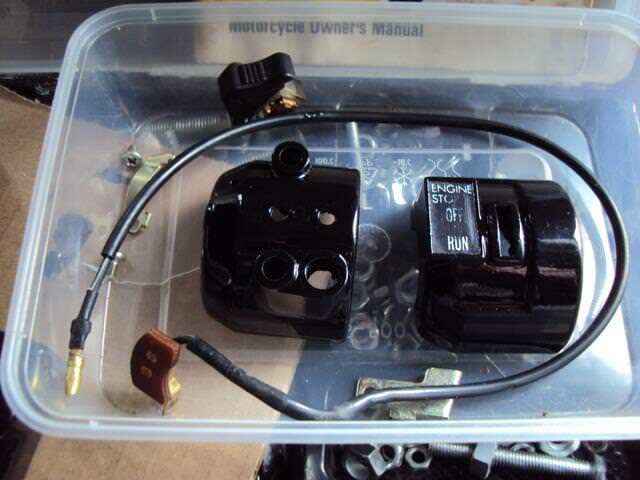 Also got the rear brake light switch fixed, it didnt work but looked good. with good wires and connectors. Took it apart and cleaned up the contacts which had gone furry, popped it back together and all good. 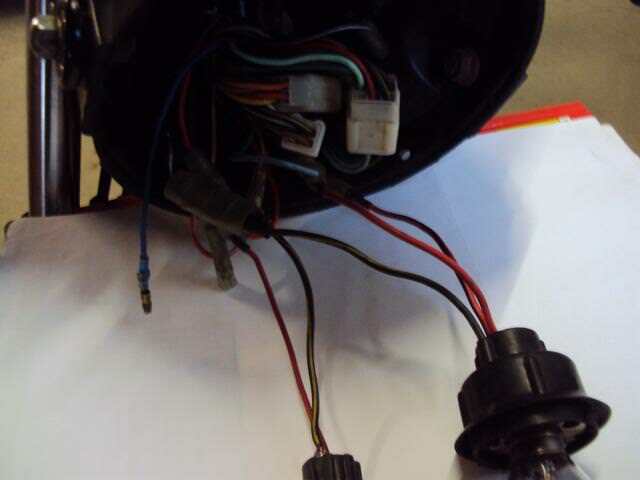 only spare wires I have now are for the indicators and front brake light switch. The mess of wires have been tamed at last. 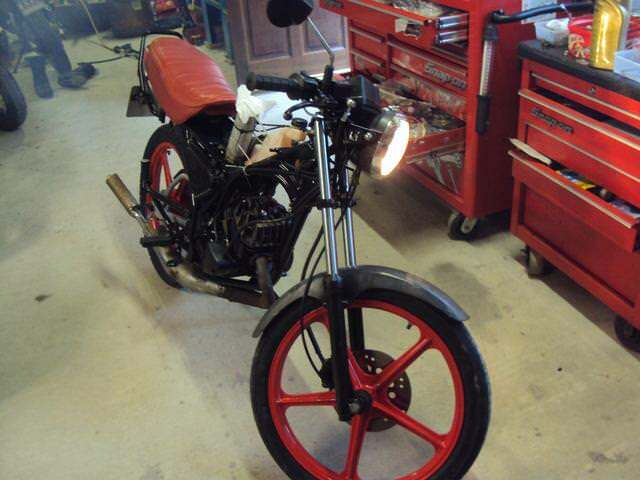 The tyre fitting went fine for the front wheel - I was able to do it by hand. The rear one was a little harder. It would not seat fully all the way around - so it took a couple of inflations and adjustments to get it acceptable. Happy enough with the tyres - they look right with the correct tread pattern. After the exhaust was fitted, I fitted a temporary fuel supply. A little premix later (to bleed the oil pump) and it fired up easily. It was too noisy to test so I will return to this later. 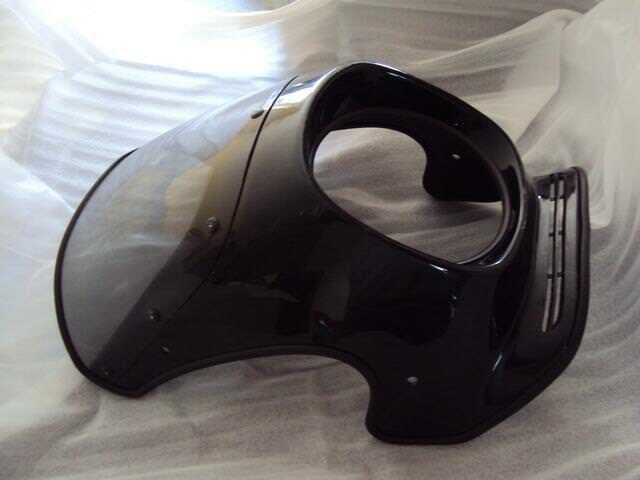 The bodywork will be a seperate mini project at a later time, It is letting the bike down now but I wanted to get the bike together, running and useable and it's getting there. The clutch - dragging and slipping, I removed the side cover and clutch to have a look. One metal plate was badly warped, was out about 3mm. I had noticed online listings for Ar and Kh plates bing the same. so I opened up the parts Kh motor and the clutch plates were badly corroded. 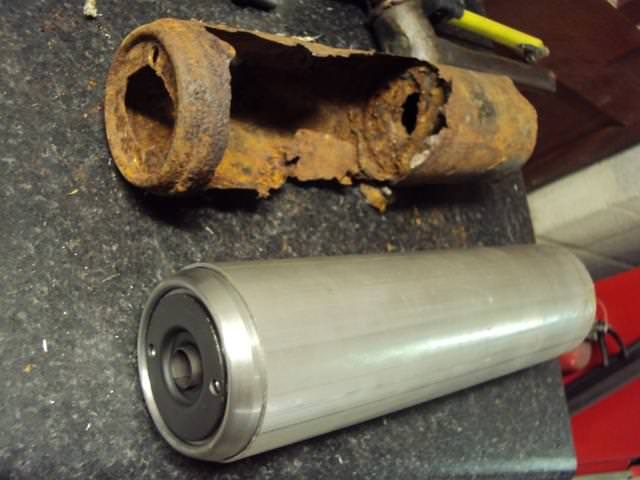 So opened up the Ar 50 parts motor and got a good steel plate in there. The 80 has more plates than the 50. Stuck it back together and it now works as it should. The fuel tank was pretty nasty inside. I had the remains of a POR 15 kit, it has done a RGV and KR1s tank so I wanted to give the chemicals a helping hand by pre cleaning the tank. Dosed it up with caustic soda solution to get rid of the varnish and some rust. Then used the POR stuff, took longer than usual as the kit was used before. Got that washed out and dried and dried and dried again. Then the POR paint goes in, gets swooshed about and drained out. Just need to wait a few days for it to dry now. Also picked up a universal fuel tap, 14x1 mm, will see if it's any good. 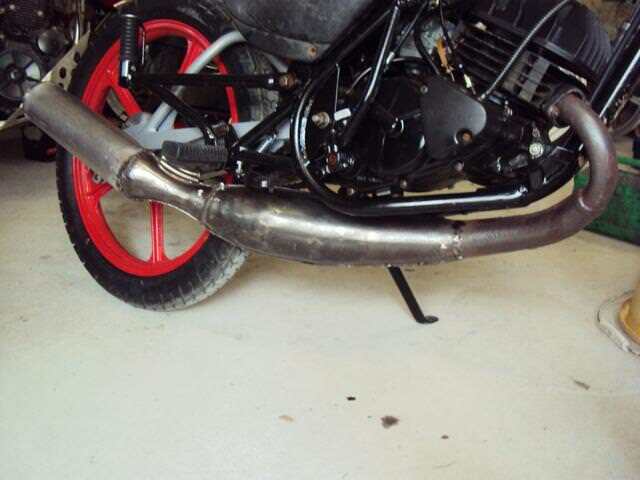 Good news is that I got an exhaust - Bad news is the exhaust - A picture will explain all. I wanted an AR80 exhaust and I got one, just happened to be this one. The only thing to do was to cut the end piece off and surprisingly the rest of it is ok. I thought about it for a day or two and then got a brain wave on how to tackle it. Basically just doing what the big K did thirty years ago. 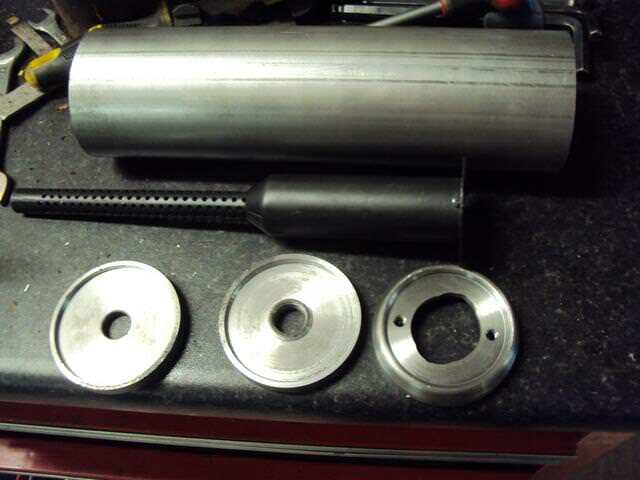 I didnt want to try pressing the internal baffles out of sheet steel, so I machined them on the lathe out of thick steel plate. The internal baffles and end cap, they are machined down to 3 mm thickness. Almost finished, just need to use my brothers mig to go around the end cap and then attach it back to the rest of the system. 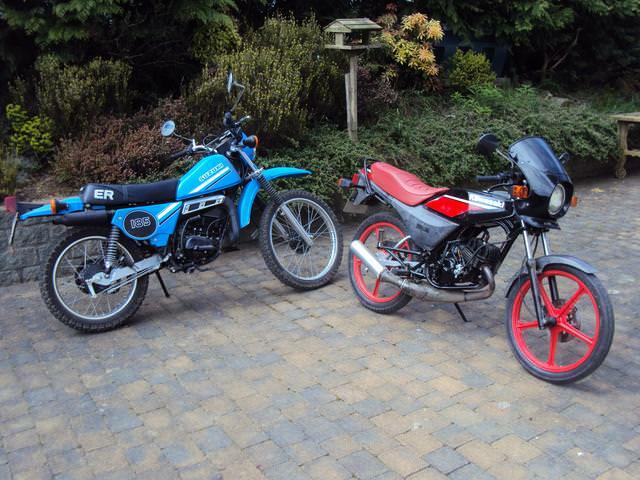 Looking forward to being able to start the bike without being heard miles away. It should look just like the original after a squirt of high temp paint. Cheers, it looked well until I decided to weld it with the arc welder. I did bring it to my brothers house to weld it with the mig, but we had to service my wifes car and ended up talking crap and drinking coffee instead. I also found out that the rest of the system was not ok, I wire brushed it and some holes appeared on the belly and the seam on the front section was split. The front section of the hybrid micron was good so I chopped it off and trimmed it up to fit the AR exhaust. Then I made a roughly 1" strip to run along the bottom of the belly to take care of the small holes. It all got arced together and now I have an exhaust. I will probably grind the worst back and mig over it before painting - it doesn't leak though so that's good. It sounds very quiet now, that distinctive AR sound is still there. 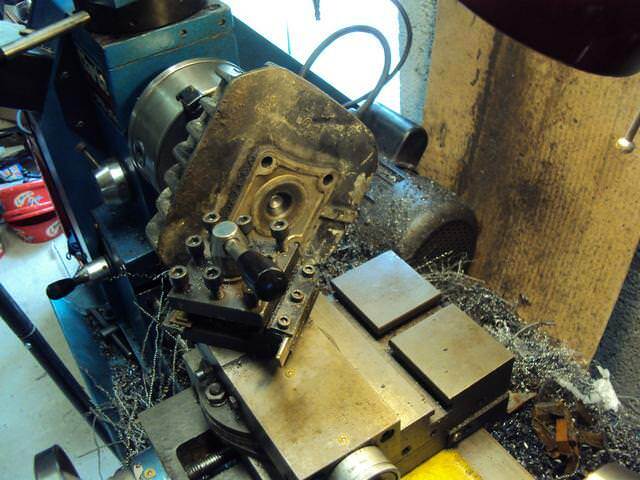 Its a mandrel to mount the head in the chuck of the lathe. The head gasket was leaking slightly, you could see small bubbles coming out. So I took the head off and found the head was pulled down where the head studs are. Must have been over tightened in the past. I have lapped heads before with wet and dry on glass, but decided to skim it this time. Here is an AR 50 head mounted to show the set up. The head was skimmed by the least possible amount - .05 mm on the un warped face. Then I cleaned it up - scraped oil and mud off it and painted with VHT. Bunged it back together and all good. 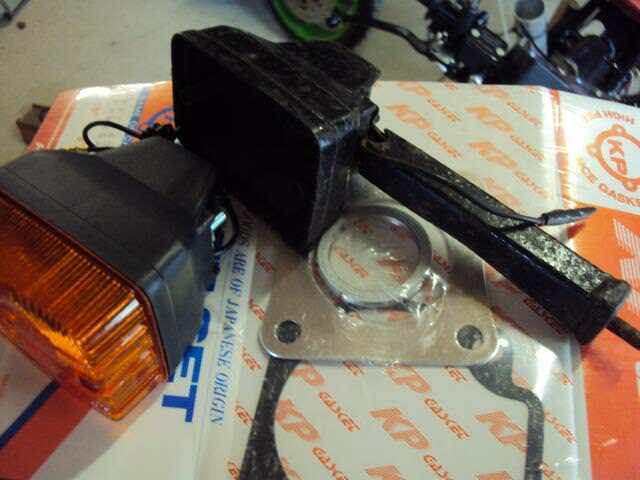 Had to repair the rear mudguard reinforcement, it was broken on both sides where the indicators bolt on. Made up two little repair panels and arced them on. 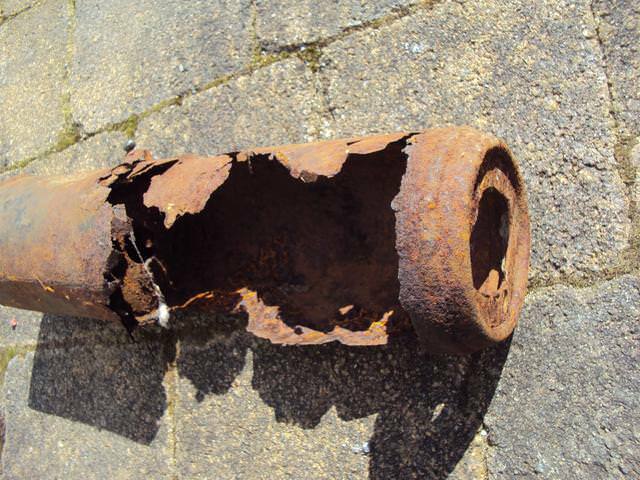 the reinforcement was steped around the repair edges so the finished repair piece would sit flush as original. A little paint and it looks good enough. 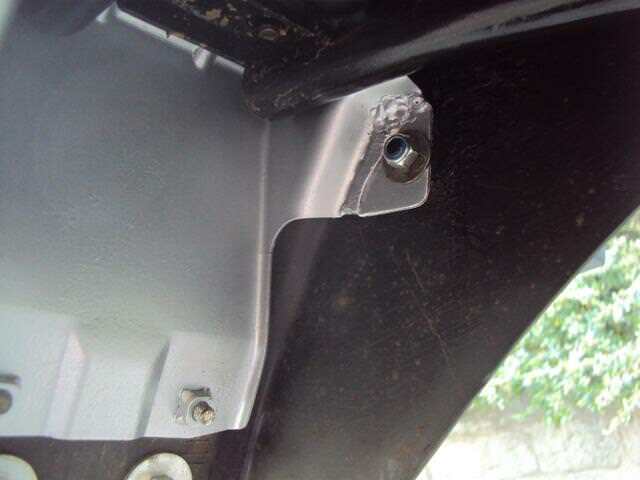 1.5mm thick steel as per the original bracket. I rang the main Kawasaki dealer during the week to see if they had the speedo drive gear, to both our surprise they had it in stock. The sun was shining so a bike trip was in order. two and a half hours later and a really enjoyable back road route through the mountains, I hand over the cash and he gives me a little bit of plastic. He would have posted it but where is the fun in that? There is an emoji on another forum of a little man hitting himself in the balls with a hammer. I think we should get it on here. The universal fuel tap wont fit because of the 90 degree elbow fouls the frame. The speedo worked but the needle was jumping around badly. The lights worked fine on pilot but blew all the bulbs when I put it on main. The good news is that it is a lovely little bike to ride - very enjoyable in the limited runs so far. Unfortunately it didn't come with any mounting hardware, So I got busy in the workshop. I knew from the parts catalogue that the C shaped bars took a M8 nut, so they must be 8mm. Got a nice piece of 8mm stainless rod and guseemated the shape and dimensions of the rods, first in light wire and then in the stainless. The threads were then cut on the ends and that's it made. Then the small upper clamps were made from large jubilee clip, perfect being plated and the right width and thickness. The lower clamps are a bit more complicated but were made from the same stuff, using parts diagrams and pictures for guidance. 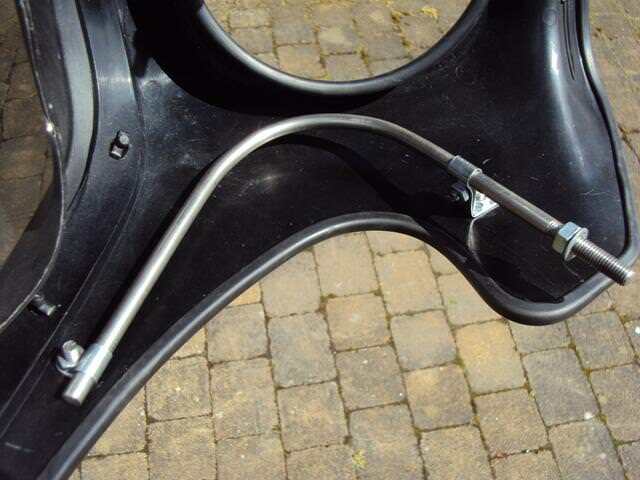 The fork clamps were made from 2mm sheet steel, with a strip of rubber (inner tube) as per the original. The stanchions are 27mm and the rubber 1mm thick giving a target clamp diameter of 29mm - the steel strip was bent around a 28mm bar and it worked out great, nice snug fit. So now I have a cowl and have it mounted. I also blew the budget and bought two NOS rear indicator arms - so now I have a full set. 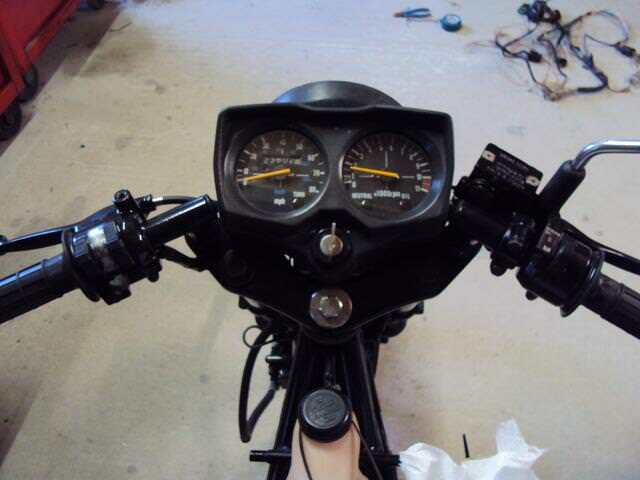 The the speedo problem is the speedometer itself. I twisted the cable to drive it quickly and the neele flicks up and then falls back to 0 very quickly - no damping. I had a spare speedo so I checked that it was working properly and fit it to the bike, first removing the just fitted cowl. I was able to take the fuel tap seal and transfer it to the original fuel tap, so It is not all bad. Clever stuff. Well done ! turns out there is an "admin" charge of 45 Euro plus the additional premium. I decided to wait until I renew the policy as I need to buy a battery for my 650 road bike - which will be roughly what the insurance company wanted - so better to wait. Bit like the Fr Ted epesode, "these cows are small, those ones are far away"
It seemed a little slower with the new exhaust and as I mentioned the angle of the pipe needed to be altered. I reluctantly took it off and cut it in half again. I found some of the perforated sound deadening material in the belly section had come off and was partially blocking the chamber. So got that pulled out, re trimmed the pieces and stuck it back together. 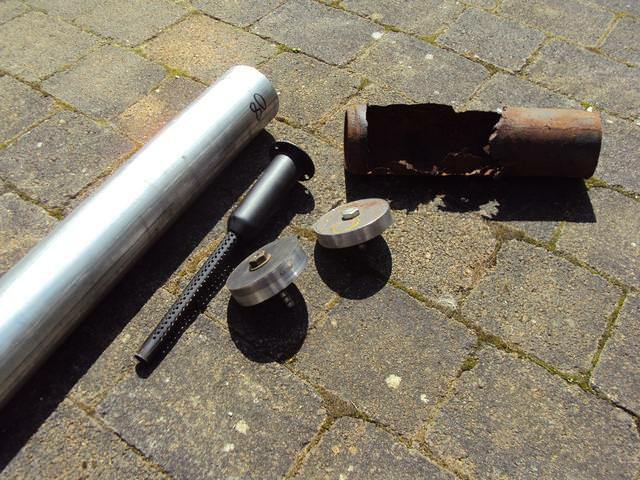 I have also discovered that rebranding can be very convenient and cost effective, for example when "lawnmower petrol" simply becomes "petrol"
Have to make the welds on the exhaust pretty and paint it and I think it is almost road worthy after that. There is not enough old Trail bikes on this forum!